We have loaded all abstracts to Volume 54. Please notify the Society administration of any errors. 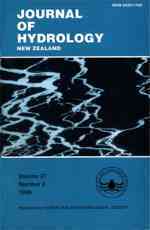 The Journal of Hydrology (New Zealand) (ISSN 0022-1708.) is published twice a year. Manuscripts are always welcome and are peer-reviewed to ensure international standards are met. The following volumes of the Journal are available for free download. We are currently updating the Journal database, please click on the link below to access them in the meantime. A number of members have been asking for this and finally here it is. We hope you find it useful. On this page you will find links to recordings of past conference talks, available for your reference. Click on the conference banner to get to the presentations. Please report any errors to the Administrator. Navigation hint: Use the day selection tool to help find the talks you are interested in. Jon Harding, Paul Mosley, Charles Pearson, & Brian Sorrell (Editors). Freshwaters of New Zealand has been written by a team of eighty scientists and managers. It provides an up-to-date survey and synthesis of our knowledge of the streams, rivers, wetlands and lakes of New Zealand. There is a strong emphasis on our distinctive environment, science and management, but this is always underpinned by knowledge developed internationally. The 46 chapters cover a range of information, concepts and theories, arranged in five sections: the hydrological cycle, running water systems, lakes and wetlands, subsurface waters, and applications and issues in water management. The book is designed for students, managers, and scientists, working in a wide range of disciplines, who require an introduction to the field of freshwater science and management, and an entry point into the wider literature. A long white cloud, snow and glaciers, tranquil lakes — part of the image that attracts thousands of tourists to New Zealand, and encourages many into careers as water managers and scientists. But there is far more to the freshwaters of New Zealand than these. Our knowledge of fresh water, aquatic biota and ecosystems has advanced rapidly in recent years. In addition to the "icons"— the salmon fisheries of the South Island, the blue duck of our mountain rivers — less well known life forms are receiving increasing attention, such as the animals that live in groundwater, often deep below the surface. To classic concepts such as the hydrological cycle and the river continuum, scientists are adding new hypotheses and theories, new management tools are being developed, and improved methods to facilitate community involvement are being applied. FRESHWATERS OF NEW ZEALAND edited by Jon Harding, Paul Mosley, Charles Pearson, Brian Sorrell. Published by New Zealand Hydrological Society (PO Box 12-300, Wellington) and New Zealand Limnological Society, 700pp, $69.95 ($14 postage and packaging). The hydrology and ecology of New Zealand rivers and lakes is presented in great detail in this book published by New Zealand hydrologists and limnologists. It is complementary to Groundwaters of New Zealand, published two years ago. The book will be a useful reference for scientists, students, resource managers and others whose interest is water and what goes on in it. Of particular significance are chapters dealing with currently newsworthy topics such as in-stream values, human health, wetlands, and the impacts of forestry, dams and pests. Many of the chapters deal with topics related to the negative impacts of our society on freshwater and how these may be avoided and remedied. An excellent resource to promote sustainable management of Canterbury's lifeblood - water. Floods and Droughts: the New Zealand Experience.